1. Put the forefoot of pet on a white paper and draw a circle (Be sure to measure on paper, lift the foot to measure is not accurate). 2. Then measure the length X width of the circle. 3. Zoom in a bit,and then contrast the table size. 4. This is the SIZE you want. 1.Because it is manual measurement, please allow deviation 1-2cm. 2.When you buy dog shoes, the size should be a little bigger than dog's foot. 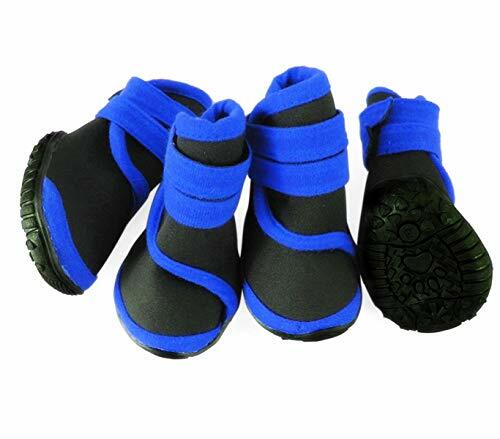 Made of Nonslip Neoprene , waterproof, comfortable and suitable for any environment like wet, slippery, rainy etc. Beef tendon material, multi-teeth anti-slip, solid and durable, protect your dog's paw from muddy or heat ground, washable and reusable. The magic button is easy to wear and prevent the shoes from falling off when the pet is walking. 1 month no reason return and 6 monthes warranty, please kindly feel free to contact us at first time if there's any query.